This map is a living document. If anything, it’s certainly alive and moving. These are the towns and cities across the nation where a dollar was sent to Herman. Thanks so much for sparing a dollar for Herman. If you have no idea what Give Herman One Dollar means, start here. Update: Ben and Terry had a blast being interview by Rick Jensen. Listen to the full interview here. This Wednesday afternoon tune in to hear all about Ben and Terry’s efforts to make a difference in Wilmington – One Dollar at a time! WDEL’s Rick Jensen will have them on the show during the 2:00 hour (right after the top-of-the-hour news). If the statement,”Give Herman One Dollar” doesn’t mean anything to you – start with the original post. If you know about the wildfire, read on. Your response to Herman continues to overwhelm us. We talked to Herman last Wednesday (4/23), and gave him some of the hand written notes that you wrote him. Ben even read a few aloud to him. Herman, I’m praying for you in Vermont. PS – We’re approaching $300 dollars (that’s what physically has come in and doesn’t take into account all the comments on the original post)…so with the match we’re over $600. Yeah! So if my math is right, that’s 300 people that have each given Herman a dollar. I love simple math. If the statement,”Give Herman One Dollar” doesn’t mean anything to you – start with the original post. If you know about the wildfire, read on for update #1. Our simple contract: You trust us and we’ll tell you the story. It’s obvious from your initial response that you trust us. Thanks. Ben and I will do our best to hold up our end, and tell you the story. The story so far? It’s working. 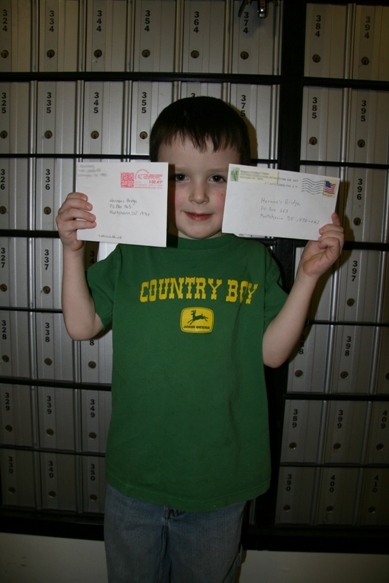 On Friday, I took my son Eli to Herman’s PO Box. Eli was seriously pumped to open box #363. And so was his daddy. With excitement, we turned the key and peeked in. It was only two days after the original post, so I wasn’t sure if we would find anything inside…but we did. Your response overwhelms us! We’re sure now that this will turn into something significant for Herman. I went to the PO box again today, and there were 20 envelopes from around the country. The layers keep expanding and we’re giving grass roots a new name. Wildfire. Ben posted a great update, check it out. Special thanks to other bloggers for posting the story, like Curtis and Greg. You can find an excellent summary on Jason Boyett’s relevant blog. It’s worth the read for the Seinfeld reference. And we’ve noticed that other Relavant readers are jumping in. Eli had “daddy” day at his pre-school on Friday. Afterward, he and I went out to lunch downtown and then took a walk over to Herman’s Bridge. We found Herman, gave him some T-shirts and fruit, and I told Herman about our experiment. He agreed to be the main character; he’s excited to see where this might go. Eli giving fruit to Herman. How this spread across the nation in about a day. (A map is coming soon that shows where the dollars are coming from). How many children are getting involved. (One kid is even giving his birthday money, that’s huge)! The hand written notes to Herman, that wrap the dollar. (We’ll make sure Herman gets each note – keep them coming). We’ll continue to tell the story. Feel free to post any questions or comments on this or Ben’s post and we’ll respond. And make sure you leave us a comment on the original post so we can track the response. Be sure to leave your name, city and state so we can track this across the nation. Thanks for helping our friend. bigish small news – what can 1 dollar really do? 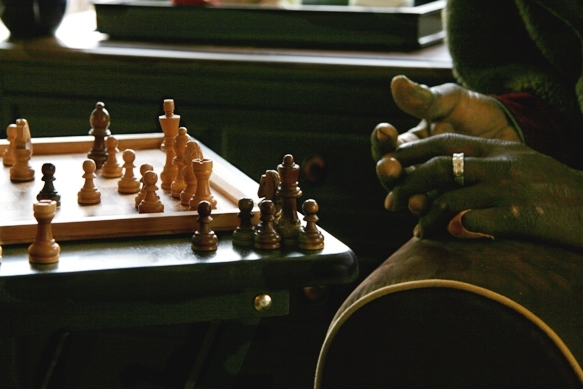 Like in chess – sometimes you need to start playing the game and figure out the moves along the way – are you in? Ben and I just started a virtual experiment, right here. Often, experiments fail. Experiments are risky. Experiments push boundaries. Many times, experiments raise more questions than they answer. But in the end, something new is discovered. It’s important to say right up front that we’re not setting out to solve any specific problem – but we do hope to discover something new – and maybe bring a little restoration along the way. You think, “Get your head out of the sky bro”. And you let these thoughts pass as melancholy begins to set in. In a split second several thoughts run through your little mind. You react. Mostly with questions that you keep to yourself. It’s amazing how quickly your brain is working today, and how good you are at having a conversation with yourself. You keep walking. It’s your choice. Since you’re melancholy today, you keep asking questions. You don’t answer your last rhetorical question. So that’s the scene, can you relate? We can. 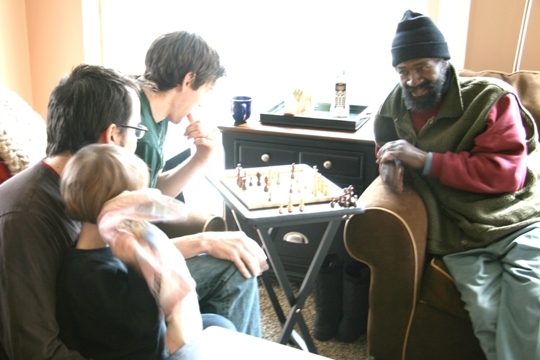 This is a picture of Herman (right side) spanking Ben in chess, while Eden and I watch. Ben, what was it – 8 moves? Ben and I take homeless people to lunch every Wednesday. We’ve discovered that in many ways, they take us to lunch. We’ve been at it for almost a year now, and it’s too much fun to stop. Our friends have joined in. We met Herman last fall, and have had a great time getting to know him, and hearing his story. We know where he hangs out, where he keeps his stuff – and how he helped raise his grand nephews while he lived with his niece. He likes chess, and his street name is Rue. He wears size 32-36 waist jeans. He doesn’t like riding far distances to buy pasta sauce. Thanks to Joanna and Ryan he has a tarp to keep his stuff dry. Thanks to Krissy – he has a sleeping bag. He’s been on a waiting list for a subsidized apartment since February 16, 2006. He’s still waiting. We’re trying to help him get on other lists. He’s turning sixty soon. He worked in a factory near the train station for most of his career, and now sees himself as retired. He has a routine to keep himself moving and out of trouble. 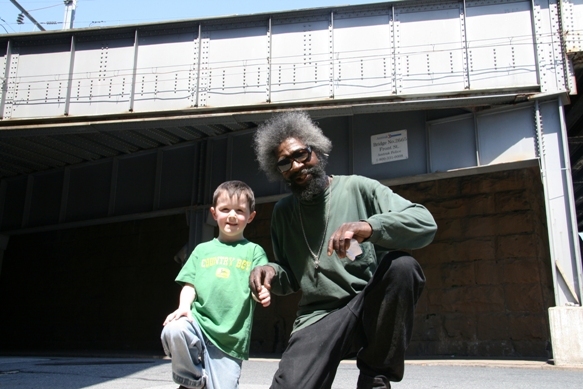 He’s a leader in his community, and police officers actually talk to him as a liaison to others that hang under Herman’s Bridge. Ben is moving to Houston in June to start med. school, and we want to do something significant for Herman before then. We need your help. The idea is simple – that a bunch of smalls would come together to make one big. Or maybe it’s better said that a bunch of smalls will come together to make a relatively bigish small. Got that? This idea of a lot of smalls coming together comes right from Shane Claiborne – he describes it really well in his book Irresistible Revolution. Ben and I read Irresistible Revolution last summer. It challenged us to listen to Jesus’ words with new ears. As I mentioned earlier – this is an experiment of sorts – and we don’t expect to solve world poverty here, or even to solve all of Herman’s problems. He has as many as Ben and I do. But if we have learned anything over the last year – it’s that we can help. We’re in a place to help. If you’re reading this – that means that you have access to a computer – and that you have time to read a random blog – and that you probably have a dollar in your wallet. Go ahead and check, seriously. We’ll wait…. Good. So here’s the deal. 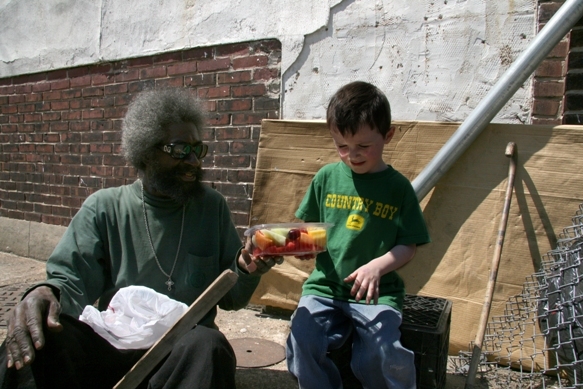 We have some financial backing; someone has offered part of their tax refund to help Herman. They said that they would match up to $500 dollars for a onetime gift to help Herman. So I’m asking you to give Herman a dollar. That’s all. You may have the same question Eli did: Can I give two? We’d rather you just give one. Be like Eli, and give your other dollar to someone else. If you live in the area – feel free to randomly walk up to me or Ben and hand us a dollar bill. We’ll know what to do. And it will become two. Or, if you live in Texas (as many of my readers do) – you can use the PO box below. This is a true 1 for 1 match, so if all seven of our readers each give a dollar (and we know that Eli is already in) – then we’ll buy something really nice for Herman with our 16 dollar bills. We’ll be creative and make sure it’s something nice. We won’t give him a life-size cardboard check – we’ll talk to him – find his need – and then get something he can use. In other words, we’re not going to give Herman cash. We’re going to work with him to see how this money might help him best. Our simple contract: You trust us and we’ll tell you the story. It’s simple. A thousand dollars for Herman. I hope 500 of you are. Remember, this is a virtual blogging experiment. But it’s true. Feel free to be critical and not join in. Or, feel free to be critical and join in anyway. Or just join the game. Comment here on this blog. Go tell 500 of your friends before June. Help us make this idea fly. PS – in case you’re wondering – I checked, and it is legal to send cash in the mail. Just wrap it in a sheet of paper with a little note to Herman and we’ll see that he gets it. We’re giving grass roots a new definition. We’re going old school here. Or send a money order or check made out to “Terry Foester”. One last thing – we’re doing this in Jesus’ name. Herman already knows this, but we want to help him understand. Here’s the reality of the situation…it’s not our doing. If my blog had a theme sound bite – it’d be the sound of crickets. Because it’s way too quiet around here. But to my seven faithful readers I say “don’t worry – good times are ahead”. This lack of activity is not because I’ve run out of strange ideas. On the contrary – a lot is going down in my head. It’s an exciting place to be. I’ll re-engage soon. In fact, a big strange idea will show up right here tomorrow. As our kids like to say, “seriously”. Headline: BIG news (or maybe bigish small news) is coming tomorrow – April 16th, 2008. Right here. I’m hoping to get 7 comments on this blog entry before then – to document that I actually do have 7 readers. Otherwise our idea will crash and burn. So go ahead – talk to me…say something nice. Until tomorrow then…keep the faith. And if you need a random update on someone’s life…check out Stretch. He’ll turn that frown upside down. 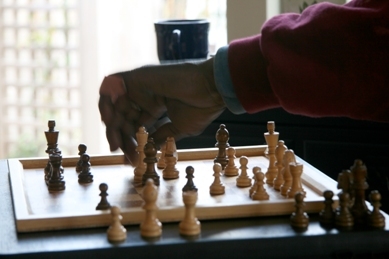 a teaser: like in chess – sometimes you need to start playing the game and figure out the moves along the way – are you in? a little love note to Libby (and all you romantics)…I stole this from my fav. Michael Pritzl of The Violet Burning. They write my favorite worship tunes and love songs. Check them out. “Aching” from the album The Loudest Sound in My Heart by the Violet Burning.